Remember how much people griped about the change from cassettes to CDs (“Wait, that thing scratches and then doesn't work anymore? What a waste! Not for me”!)? And then to MP3s (“Wait, you mean I don't even get something with my music on it? It's just on a computer or something? Ridiculous! Not for me!”)? 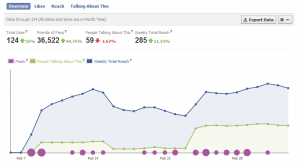 The latest uproar is about Facebook Timeline. Look, I get it. When you're addicted to social media (and, let's face it, we are), change is rough. Facebook is like a comfy pair of pajamas–you log in, go to your profile page, look at your feed, and are immediately surrounded by the cozy confines of your online life. Then, suddenly, somebody's taking your pajamas and replacing them with a burlap sack–it's rough, unwieldy, unfamiliar, and scratching you in all the wrong places. 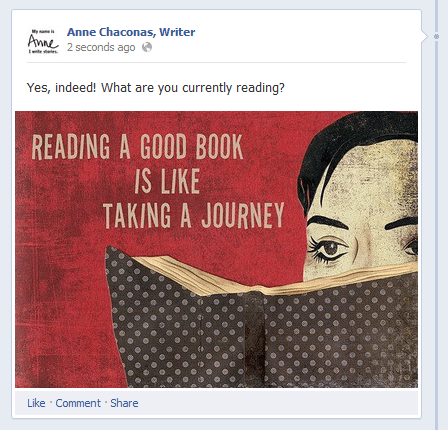 Here's the deal, though: Facebook Timeline is awesome. It really is. And I'm here to tell you why. As writers, we're all mostly consumed with telling the stories of others. However, our fans might also be interested in something else: our story. Want to note when you wrote your first short story back in the 6th grade? Want to put up a picture of the poem you wrote your mom for Mother's Day back in 1987? You can do all of this, and more. This is where the timeline aspect of Timeline really comes in. Not only can you add all these events, you can add them on the actual dates they occurred. You can craft a full story of your creativity, one milestone at a time. 2. Facebook Timeline is heavily pictorial. On the surface, this may not seem like something that matters. Believe me, though, it does. And it's particularly great for authors who, like all artists, are big on sharing images (especially the covers of their books!) and pictures. The previous Wall layout was okay when it came to showcasing pictures, but the new Timeline layout almost gives your page a Pinterest-like feel, with bright, large images dominating the screen and making your page look vibrant and colorful. Now you can showcase your book covers, locations, and pictorial inspirations, making your page a gorgeous rainbow of color. 3. Your cover image is a wonderful branding opportunity. You've heard it before, and you'll hear it again: Branding is key. Creating a cohesive image for yourself will allow your fans to recognize you automatically in whatever social network they happen to be. Having the ability to use a cover image (the dimensions of which are 850 pixels by 315 pixels, by the way, for those of you Photoshopping your way along) now allows you to brand your Facebook page in a way that you never could before. 4. The “About” section is an excellent marketing opportunity. The “About” blurb used to be relegated to a small, limited, cut-off box below the profile picture on your page. It was unlikely to be noticed, much less read, by visitors. Now it is featured prominently right below the cover image and profile picture; in fact, it is one of the first places to which your eye travels. I use mine to talk about my upcoming novel, Salve Regina–and once Salve is out, I'll use it to talk about my other projects. 5. The analytics are off the hook. And so much more. You can see how your follower numbers, reach numbers, and general fan outreach has changed. You can see the gender, age, and location of your audience, those talking about your posts, and those you are reaching. Scroll down and you'll see your post “virality”–the percentage of people who have created a story out of things you have posted on your page. You can see how many people have commented, clicked, and shared your posts. This kind of information is essential to figuring out what is engaging your audience so that you can give them more of what they want. The accessibility of these analytics is a huge improvement from the old page layout. 6. You have the ability to receive messages from fans via Facebook “email” right on your page, and you can respond directly to your followers. This is huge, and brand new. Of course, the negative to this is that the more fans you have the more likely it is that the number of communications will get out of hand–but this new ability to send and receive messages to and from fans gives page owners unprecedented access to their fan base and unparalleled engagement opportunities. 7. You can highlight and feature posts. Want to make a post really stand out? Highlight it! The post will then span both columns of the Timeline layout, the font and size will increase, your words will jump from the page (of course, you can un-highlight at any time). Both of these functionalities are excellent for highlighting good news and for featuring promos, contests, and giveaways. 8. Managing your page is a breeze. The Timeline Admin Panel is awesome. 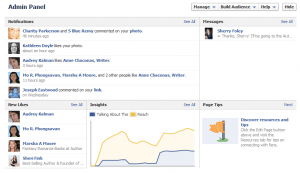 Everything is one place: interactions, new fans, messages, insights, and even tips. It's a one-stop shop for all your page needs, and you can hide or show it at will. I love this panel–I almost wish my own personal Facebook page came with something like it! Facebook's Timeline is also good. Embrace it. Take advantage of it. It's not going anywhere, so you might as well. And, I promise, you'll learn to love it. I was born in Central America and educated in the U.S. Northeast. I moved to the Deep South for love and currently live on the East Coast (and miss winter terribly.) My snarky husband, adorable daughter, three rambunctious cats, and two very adoring dogs keep me busy. 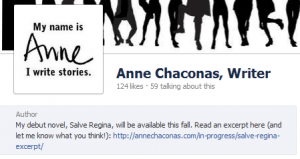 Salve Regina, my debut novel, will be available this fall. You can find me on Facebook, Twitter, Pinterest, Google+, and Tumblr. Thanks. I was unaware of how well this could work for me. Hey Yvonne! I’m glad you found the article useful. I am a firm believer in that the new Timeline layout will actually prove to be a great boon to authors and writers–it’s a much more creative platform than the previous Page and Wall. Learning how to harness it is not only fun, it will also be beneficial to your brand! It’s a win-win! 🙂 Thanks for reading and commenting! Have featured this on my Twitter/Facebook! Great post, keep writing Anne. Thanks, Louise! It is most appreciated! 🙂 I’m glad you found the article useful–and I will certainly keep right on writing! Timeline is nice for brands, but overall it doesnt’t help pages (if they continue switching personal profiles to timeline). Already 40-50% from personal profiles are changed without possibility to revert. Posts published by brands that land on pages with messy timeline for personal profiles are easily missed. I own a business page with 1767 fans. Before timeline, when i published a post, it reached to 200 of them (in a week). Now, in same period of time, it reached 60. Why should i pay for advertising and gather database of fans if i cannot engage with them???? Facebook should be very careful, maybe they accept losing a few million users, but they cant afford losing advertisers. That’s interesting, Stephan–I’ve actually seen an increase in my interactions, reach, and virality since implementing Timeline–granted, I was an early adopter. Hopefully your outreach numbers improve! Best of luck! Uncheck box with page views and let just unique visitors graph. If you look everywhere on facebook blog and facebook official page, 2 columns confuses everybody, including me. Most of us dont want to concentrate when we browse the posts on our wall. Make a test for yourself. Briefly Scroll down on timeline and on a wall and write on a paper the number of posts you remember on each one. This changes are overwhelming from my point of view, it makes me be concentrate when i surf facebook and i dont want to. i want to be simple and relaxing. therefore i deleted all posts, mesasges and photos in my personal account and i am keeping just business account for the moment. I promised myself i will not invest one cent more in advertising until i know for sure the impact of timeline . Thanks Anne! That was delightfully informative, and has made me eager to brighten up my own page! You are most welcome! Facebook can be fun–and they certainly implement things with the best of intentions and the broadest of possibilities in mind. The more you embrace it, the better it gets! 🙂 Enjoy! This is great! I was hating the changes, but now I realize they’re not so bad. I couldn’t get my cover image to change, but I had the wrong dimensions, so now it’s all fixed and I’m pleased with the way it looks. Thanks for the really helpful info, I’m sharing on all my social media sites! Hey Marie! I’m glad you enjoyed the piece and found the information useful–and thank you for sharing the post on your networks! It’s definitely much appreciated! The layout and analytics are great, but the timeline itself is a nightmare. It no longer offers a chronological option to sort through the posts. I have stuff from last summer popping up and have yet to find a way to keep the important stuff at the top despite the highlight and pinning features. 🙁 My fans can’t find the old posts to grab links they need. It’s counter-intuitive for a timeline to have no concept of time. Sigh. Have you tried using the calendar function on the top right of the page (right underneath the “Home” button on your Facebook navigation bar)? That will let you choose which month you’d like to see posts from. Not sure why you are having old posts pop up (unless you mean the “Recent Posts By Others” feature on the right top of the Page, which may have things which are much older than you own recent posts), highlighting, or pinning–hopefully, those things resolve themselves for you! hey! thanks. nope, i have old posts made by me – most from about a year ago, that are showing up at the top of my page. more recent posts get hidden in the timeline. hate it. wish i could turn that feature off and make it chronological. I’m scared of switching to timeline, don’t really want to reveal every aspect of my life on fb for privacy reasons. Then again, FB might for the switch on all us.